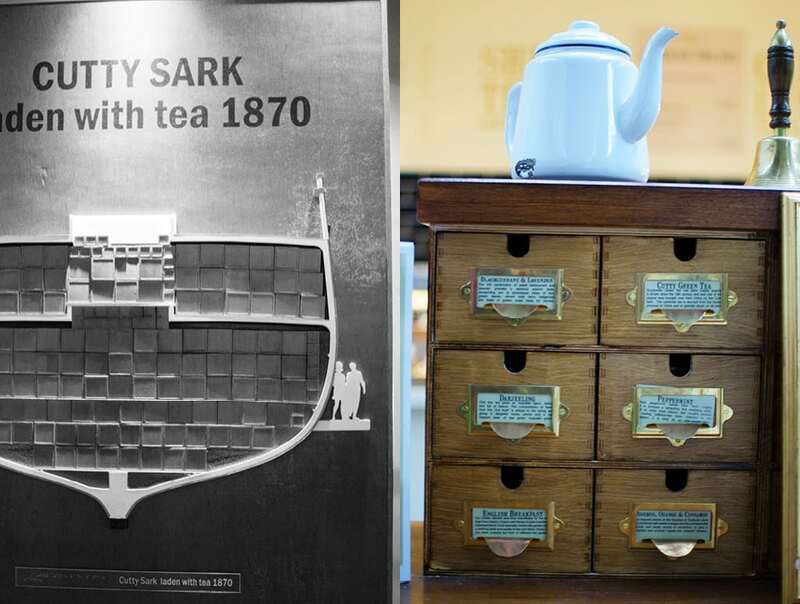 Even before the Cutty Sark, speed was the name of the game in the 19th-century English tea trade. The country was mad for the delicate Chinese leaves and great wealth and public adoration went to the ship that was first in retrieving each season’s first shipment. This was the age of the great three-mast clipper ships, designed to make this blazingly fast run from China to London in about 100 days. The Cutty Sark, always fasionably late. In 1896, the shrewd businessman John Wills inherited a shipping fleet from his father. Driven by a keen sense of competition, and not satisfied to merely participate in the tea trade, Wills wanted to take advantage of the great wealth due to only the fastest of the clippers. So he sought out a young ship designer with little experience but a reputation for innovation, Hercules Linton. Linton had just opened his own shipyard but was yet to gain any clients so when Wills showed up he was anxious to get his first commission. A bit too anxious as it turned out. Wills, knowing he had the advantage in negations with the brand new concern, extracted an onerous contract from Linton which later was to be Linton’s undoing. 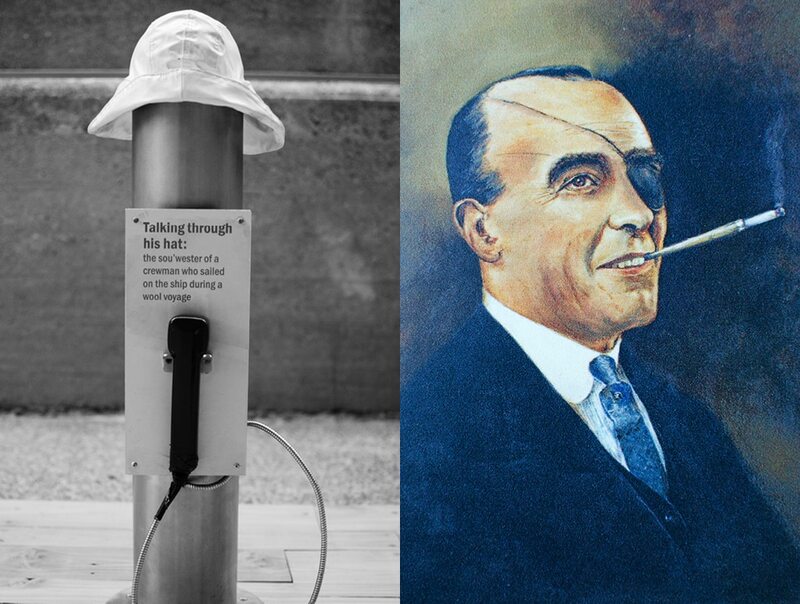 But for Wills, whether lucky or calculated, his bet on the untested ship designer was spot on. Linton quickly got to work rewriting the rules of clipper design to produce something revolutionary for the day. Clippers were fast but that speed came at a cost. Streamlined wooden hulls with great rigidity made for a speedy ship but rigidity required massive timber structures that greatly reduced the cargo space and, therefore, a ships profitability. Linton’s out-of-the-box thinking resulted in a hybrid hull composed of a rigid wrought iron structure sheathed with flexible wood planks. And for the real stroke of genius, Linton used for the first time on a ship’s hull a newly developed alloy called Muntz metal. This golden material resulted from the combination of copper, zinc, and iron and had the unique property of leaching copper when in contact with salt water. That made it repellent to any living thing that typically attaches itself to a ship’s hull as it sales along. With the reduction in drag from limpets, seaweed and various other sea creatures that like to hitch a ride, Linton’s new design was sure to be the quickest thing on the high seas. 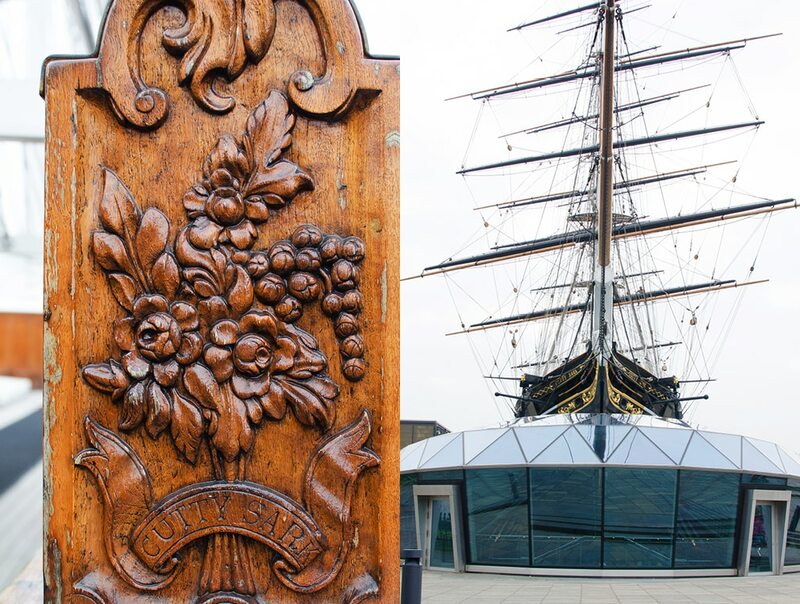 In the local paper for November 23, 1869, a small announcement indicated that the previous day the Cutty Sark was launched. In that very same paper it is also announced that celebrations had just taken place to celebrate the opening of the Suez Canal. Ironically, the fastest clipper in the world launched on the same day clipper ships, in general, became obsolete because, with the new shipping route through the Suez Canal to China, Steamships not clippers could make the trip faster and with much greater cargos. 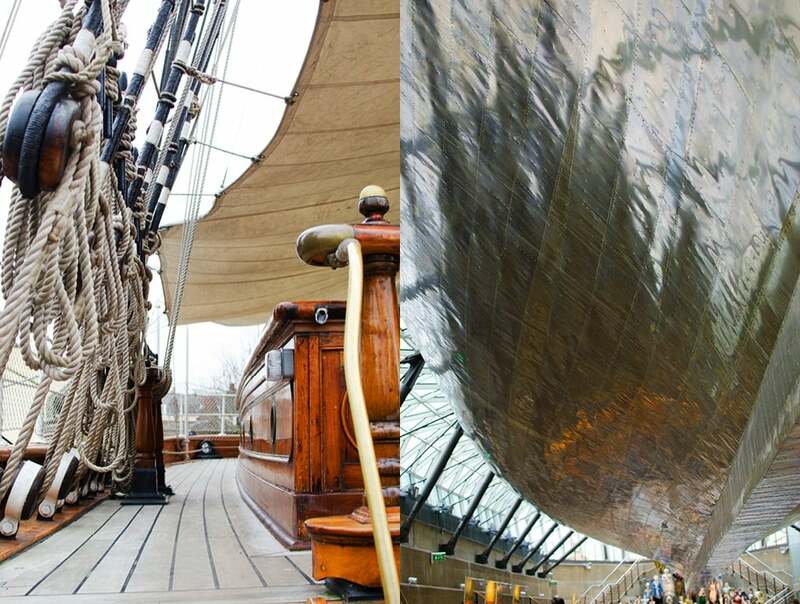 But it would take several years for the change over to steam and in the meantime, the Cutty Sark would come prove Linton’s genius in designing the ultimate clipper ship. 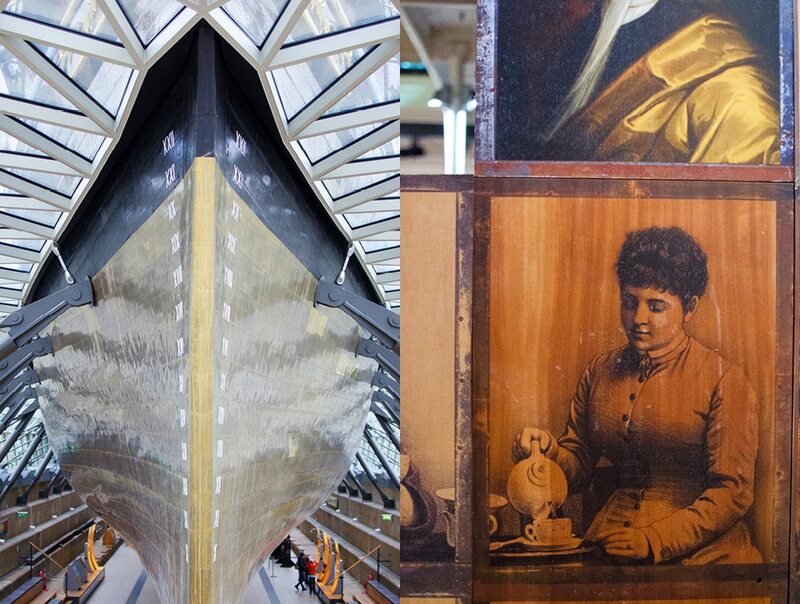 Soon after its launch the Cutty Sark had an opportunity to show its true colors. Loaded with a full cargo of tea it left China on the same tide as the Thermopylae. As the two ships headed into open waters the Cutty Sark showed her brilliance easily pulling away from the Thermopylae and eventually disappearing in the distance leaving the Thermopylae in the preverbal dust. Rounding the Cape of Africa through the Cutty Sark found herself buffeted by unprecedented storms, so much so that her rudder was ripped clean off and disappeared. 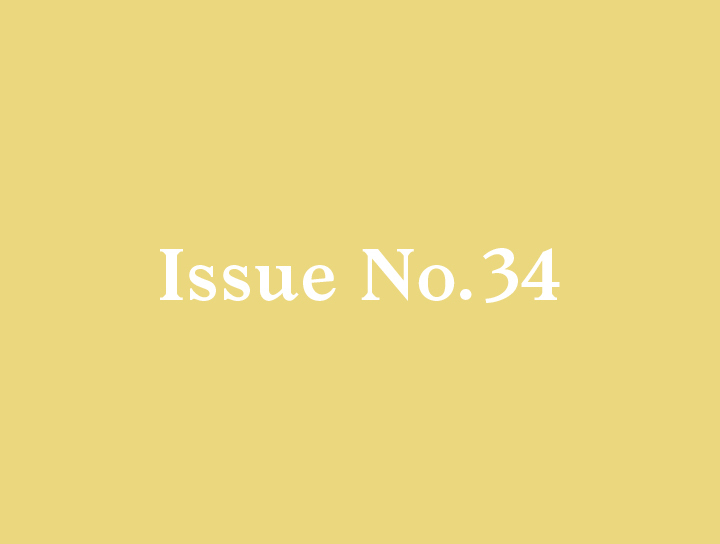 Faced with the choice of either heading into port for repairs or attempting a risky repair in rough seas, the captain chose the latter which cost less time but extracted a heavy human toll. The captain’s own son was one of the crew members most critically injured by the collapse of the makeshift forge set up on deck as it was several times overturned by the rough seas. 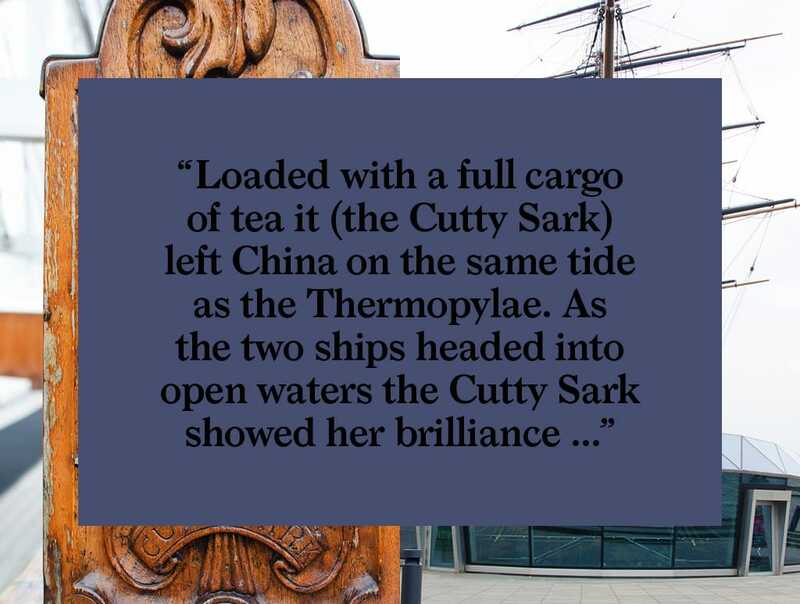 So the Cutty Sark, while the undisputed fastest clipper on the seas, never succeeded in being first to London with the new season’s tea. 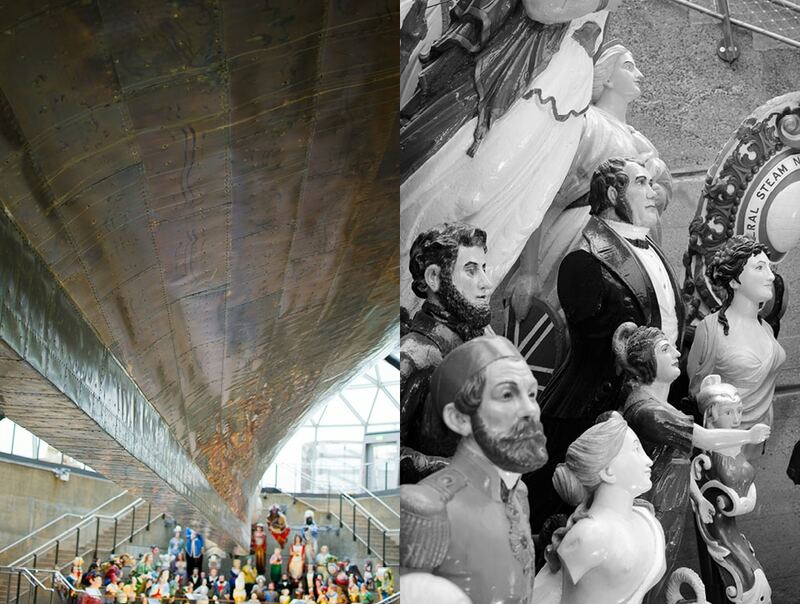 But even as the looser, the Cutty Sark, captain and crew became popular heroes of the day for their daring repair and good old English determination and sacrifice. With steamships now dominating the tea trade, the Cutty Sark eventually shifted its attention to the transportation of wool from Australia, where for a brief time clippers were still faster in navigating the route between Australia and London. 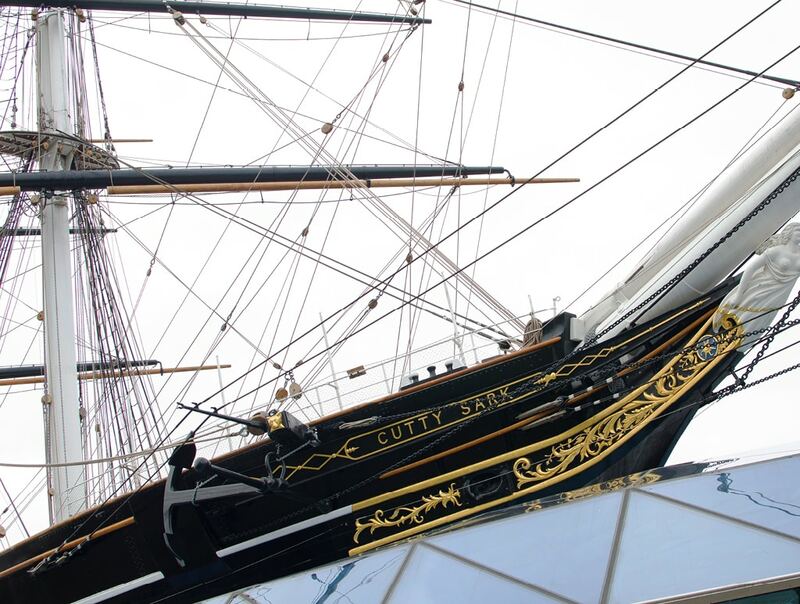 Falling on hard times for a time and disappearing from notoriety, the Cutty Sark eventually showed up in Cornwall, was fully restored to its former glory and in 1954 made its way to Greenwich to become a museum ship and part of the National Historic fleet. 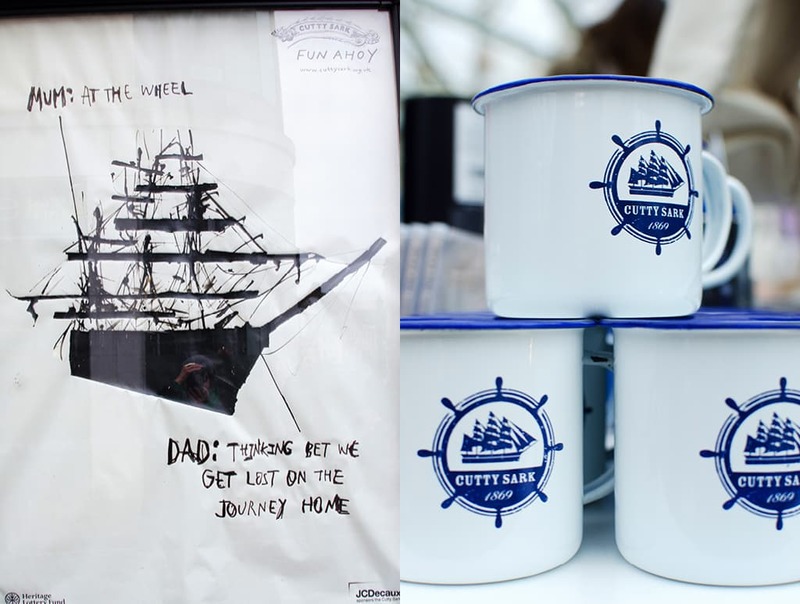 The Cutty Sark comes home. 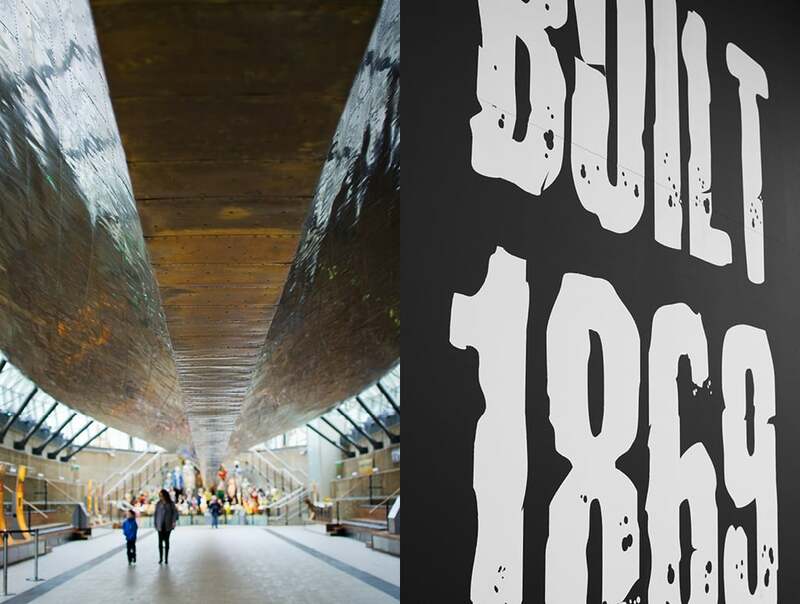 With its grade one listed monument status and on the building-at-risk register, the Cutty Sark became an instant visitor success. That was until in 2007 when a fire broke out during some renovations. The culprit, a faulty hoover. 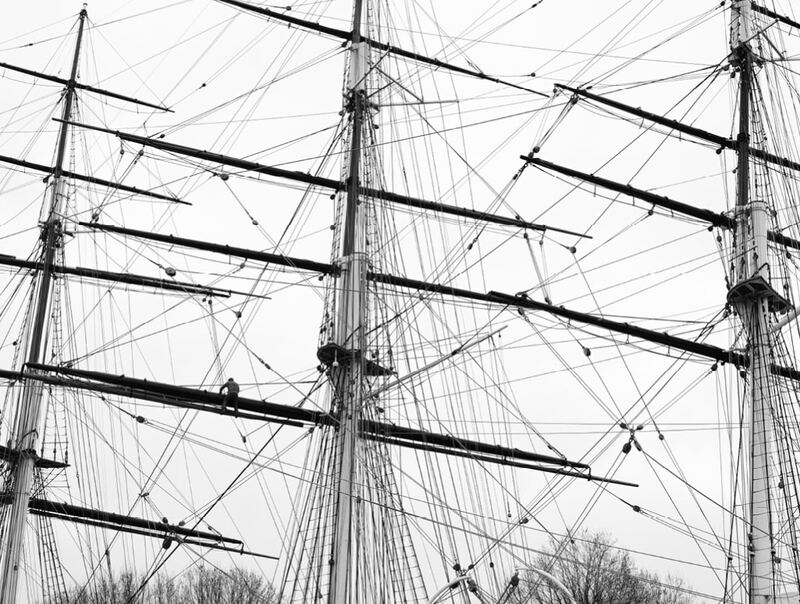 But once again, luck won out in the end for the Cutty Sark. Most of the precious original floorboards and cabins had been moved off-site for restoration so the ship was salvageable. 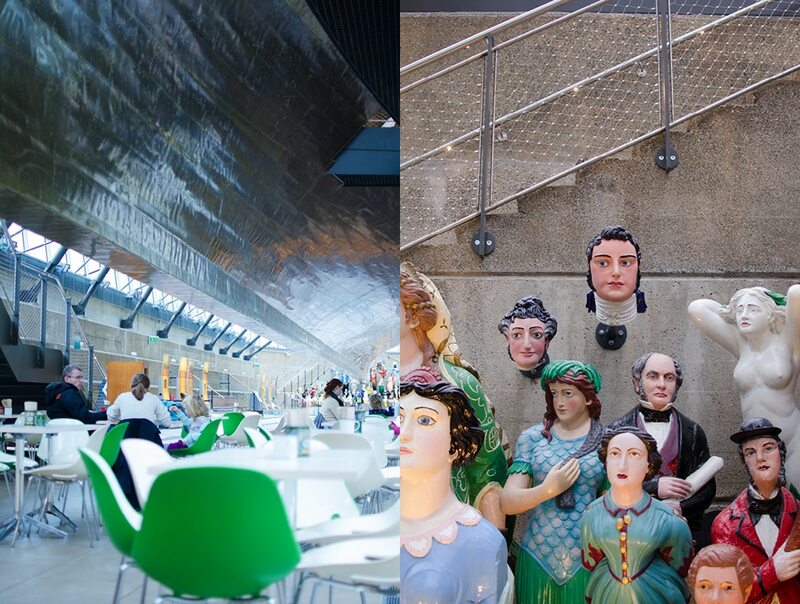 By 2010 the Cutty Sark was like new again and proudly suspended 3 meters above its new and final resting place, a glass enclosed “dry dock” designed by the British architecture firm, Grimshaw. 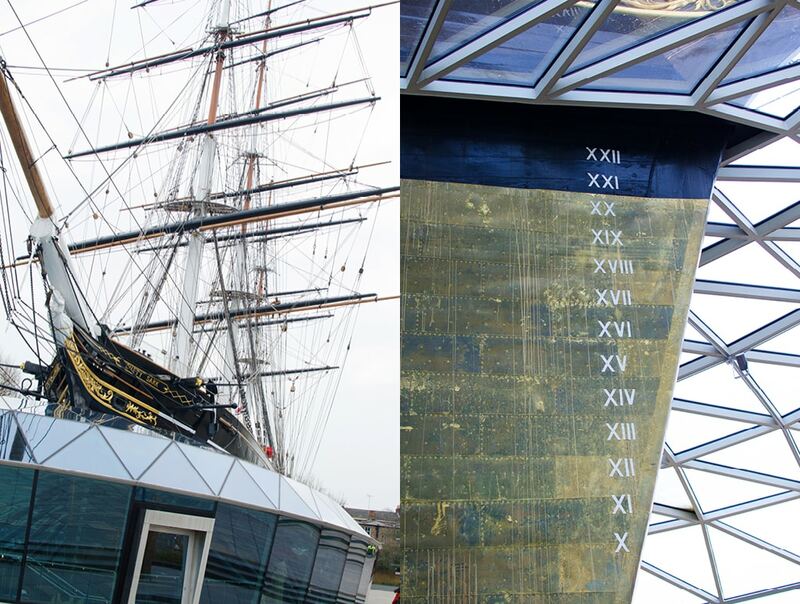 A new slip for the Cutty Sark. Upon entering the dry dock you pass through the gift shop making your way along a ramp into the main body of the ship. 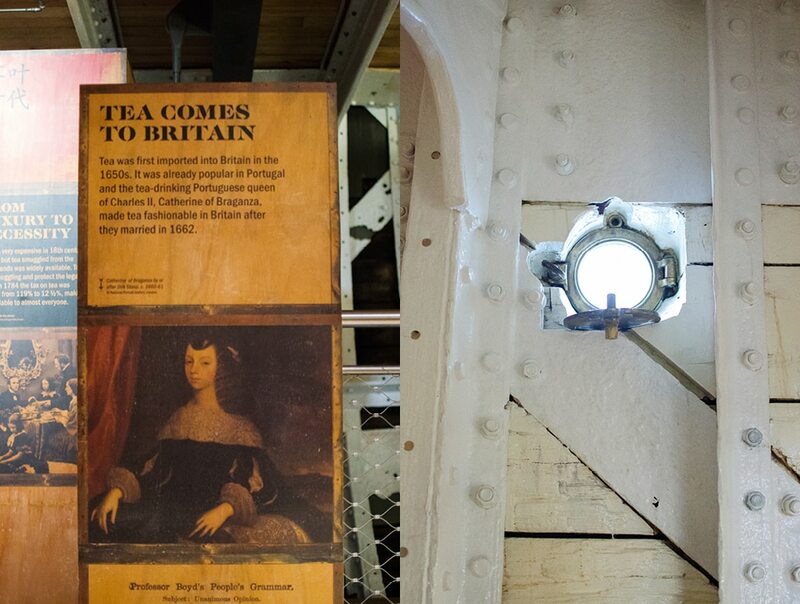 Here you see how the ship was so efficiently loaded and a timeline is on display to lead you through the history of tea and England’s long affinity for it. If you have kids in tow for your visit, the interactive displays offer an engaging educational experience with listening stations where old crew members voices are represented tell tales about life on the Cutty Sark. 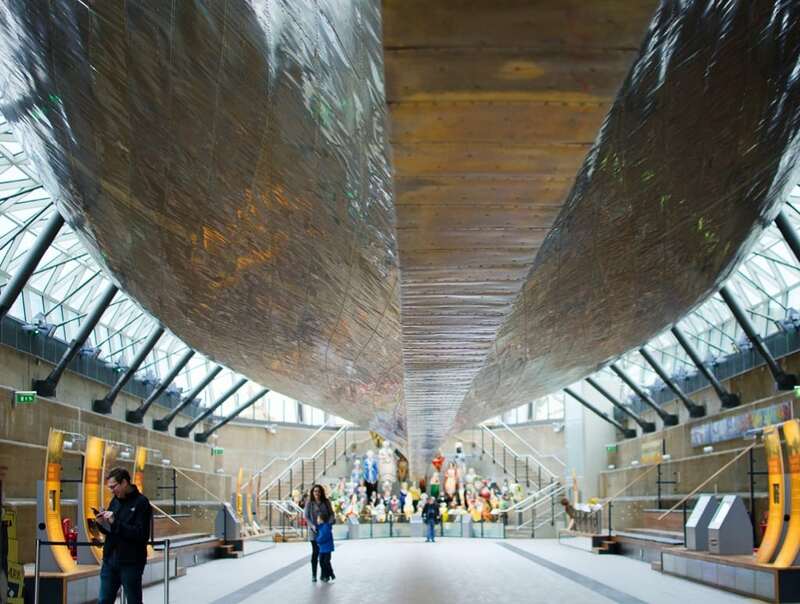 One, in particular, tells the story of the Cutty Sark’s naming. It was suggested by Linton and Based on the epic poem “Tam o’ Shanter” by Scottish writer Robert Burns, telling the tale of a farmer named Tam who is chased by a scantily clad witch named nanny, dressed in a “cutty sark”, an archaic Scottish name for a short nightgown. An odd name for him to select for his new clipper as witches cannot cross water. Hands-on interaction is encouraged with many installations containing drawers and interactive visuals which make the history lesson very entertaining. I especially enjoyed the moving benches which rock back and forth simulating the movement of the ship, as did several kids jumping on and off them next to me. Winding your way up through a small staircase to the deck of the ship you can imagine the hustle and bustle of the crew navigating the tiny spaces. Looking up you get dizzy just imagining that sails had to be set by hand climbing up and down the rigging in strong winds with the ship constantly swaying. It is not for the faint of heart. Making your way underneath the belly of the ship is a great place to enjoy a cuppa while contemplating the true genius of Linton’s hull design and golden “high-tech” protective cladding. A short climb out of the dry dock you find yourself conveniently where you entered, in the shop. Inspired by my maritime excursion I decide to take the boat back up the Thames to central London. A fitting end to my imaginary journey on this very real legendary clipper of high seas. 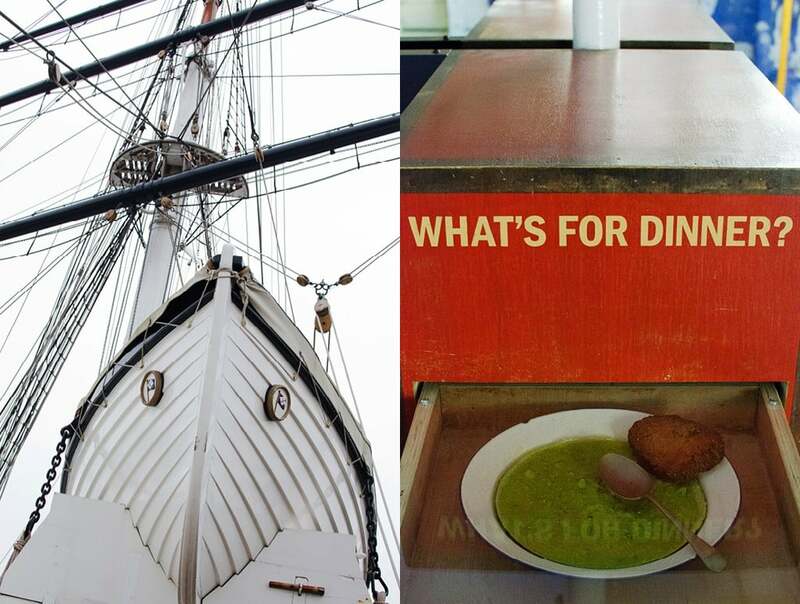 Planning a trip to the Cutty Sark in Greenwich? Here is the current weather and what to expect for the next few days.